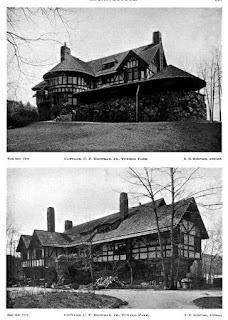 'The Breezes', originally the James L. Breese residence and later the Charles Frederick Hoffman Jr. residence designed by Robert Henderson Robertson c. 1887 in Tuxedo Park, New York. Breese left Tuxedo Park in 1900 after building 'The Orchard' in Southampton on Long Island. Hoffman's father was the Reverend Charles F. Hoffman. Click HERE to see 'The Breezes' on google earth and HERE on bing. Photo from Architecture, 1900.